Nighttime Conference of Hong Kong surrender of Governor Young and General Sakai 1941. Represented the signing of the surrender of Hong Kong by Sir Mark Young in 1942 in a candlelit room at the Peninsula Hotel. A Japanese officer remarked, “history takes place at night”. 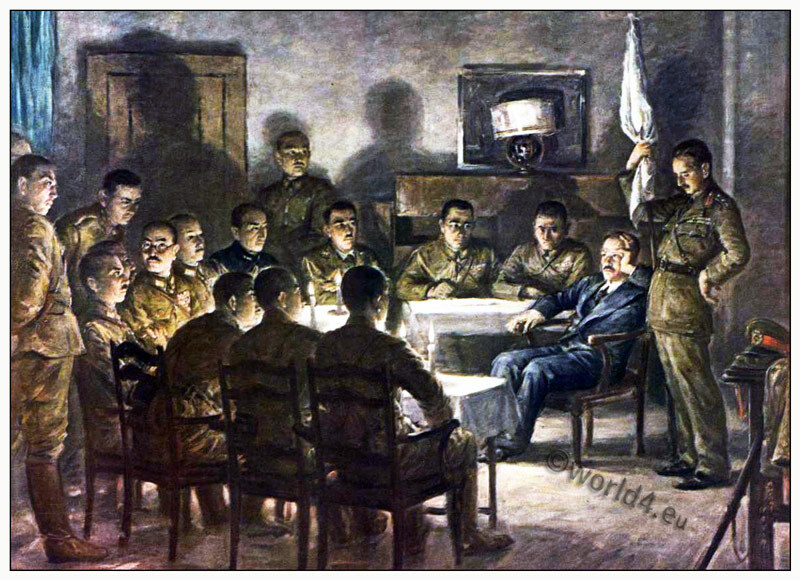 General Taikashi Sakai receives the British surrender in the presence of high officers. The battle loss of British and Allied defenders totaled about 4,000 soldiers. General Taikashi was executed in 1946 as a war criminal. This entry was posted in 1941, 20th Century, 40s, Asia, England, Japan, Military and tagged British Military Costume, Japan Military on 6/3/13 by world4.